Day 39- Looks like we made it! We left Ashland and headed for the coast. The weather was perfect overcast and the rain held off all day. We followed the Capital Trail most of the day and made it to Yorktown right at 5 pm. I will try and describe the feeling you get after riding almost 4000 miles on a bike. First, you know you are done in 100 miles so the day drags on as you ramp up anticipation. Then, your determined to finish as fast as you can. After the burn settles in, you become nostalgic and look back on all the people you have met and what we have seen. Lastly, you cry the last five miles as you realize you have just accomplished something that less than 1% of people do. 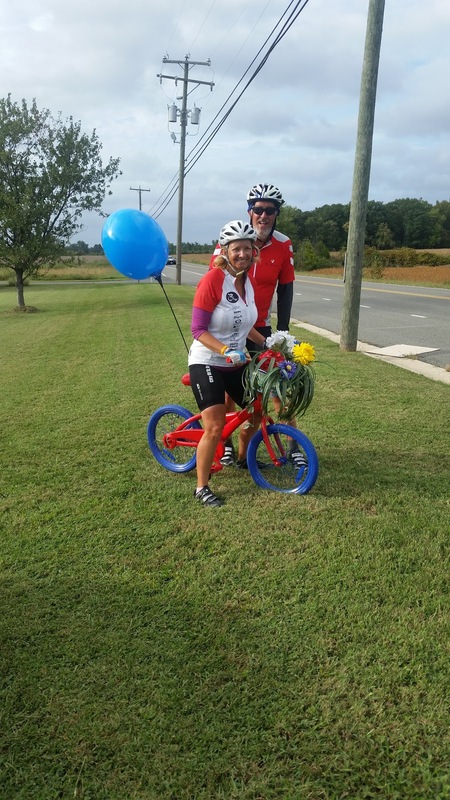 You have rode your bike across America!! This just shows that average people can do hard things. One pedal at a time, one day at a time. A huge Thank you to Bob, my hubby! 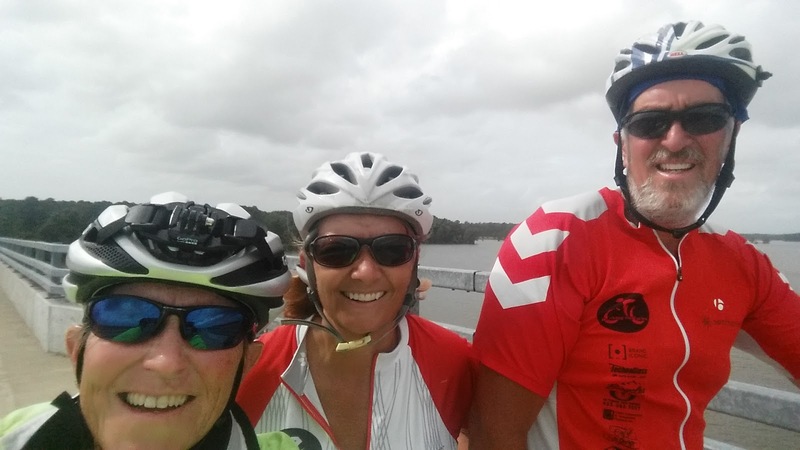 He amazed me with his strength to ride 39 days after a knee replacement 4 months ago. He never complained and said he loved the whole adventure. I couldn't have made it without him. Second, thanks to all my sags- Baron, Don and David, and Dad. All of them were troopers and supported us every day on this journey. Lastly, thank you to the Switchpoint team. You guys are amazing and inspire me to keep on keeping on! See you soon. Made it to the Atlantic! Bob proud of his biker tan! I am so excited to meet with Utah Senators Lee and Hatch tomorrow. Stay tuned! Day 38- Chain wreck not gonna stop me! Today we had NO RAIN! I was so happy. 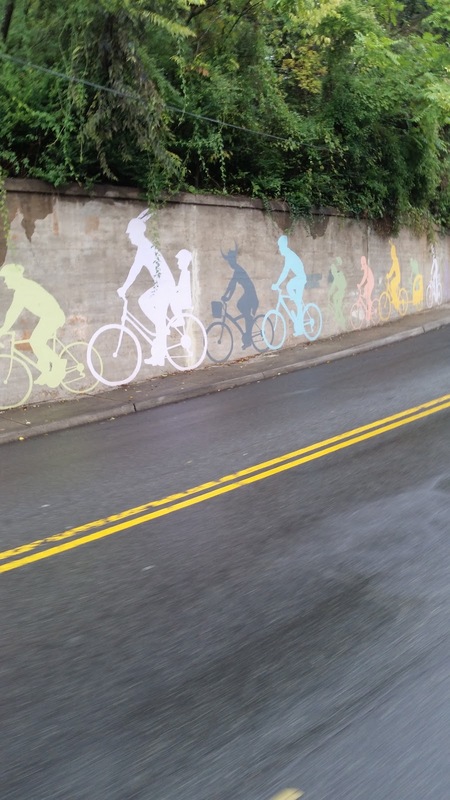 We rode into Charlottesville to visit the Haven. 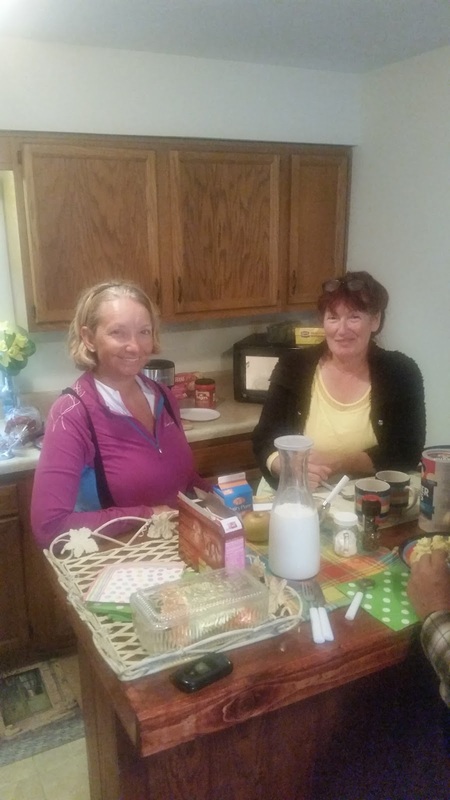 It wasn't open yet, but I got a chance to visit with some of the clients who were waiting to use the services. The Haven offers day shelter- laundry, food, housing assistance, etc. There is no night shelter in Charlottesville. As I visited with four of the men, they echoed what I have heard across the country. The echo of once they have a felony- no one will employ them or rent to them. The echo of once an addict- you are treated like an addict forever. I found Joe in the park across the street from the Haven. He was asleep on the bench wrapped in his blankets. I asked him if he wanted anything to eat and offered him the two Cliff bars from my bike. He was kind and considerate but broken. Joe had been on the streets for over 30 years. He said he didn't really remember anything else. I asked him if he wanted to change anything but his reply, "I don't know how." As we continued along our route past Palmyra several dogs gave chase. Wouldn't you know the day I think we are safe and leave the spray with the Sag- then they all come out. Two were very close to biting me on the back of my calves. It got my adrenaline going so much that we rode faster than any other day. It helps that the hills are gone. Made 89 miles in 7 hours. We have had more problems with our chain and gears in the last five days. So we have dubbed it Chain Wreck. Bob gets a punch in the kidney from me if he puts in a gear he is not supposed to. We broke another tooth off our chain ring and lost our chain twice today. It is becoming more like a Nascar pitstop than a bike ride. Thought for the day- Life is a trip. The only problem is that it doesn't come with a map..We have to search our own routes to reach our destination..
We are almost done. I am feeling excited, anxious and kind of sad. Sad because I have enjoyed being with Bob everyday for the last 38 days, sad because I have loved meeting with shelters and people in homelessness. I am way more excited than sad. I am excited to go back home, back to work, back to family. I am excited to put into play what I have taken back from this experience. Thought for the day- Many of us have fears. We are afraid to try things because we are scared of failure. It takes a first time attempt to get over some fears. Sometimes we don't try things because it is out of our comfort zone. Other times it is because we don't want to offend anyone. One thing I have learned on this trip is to stretch myself and my comfort zone. Have some first time victories. 1. 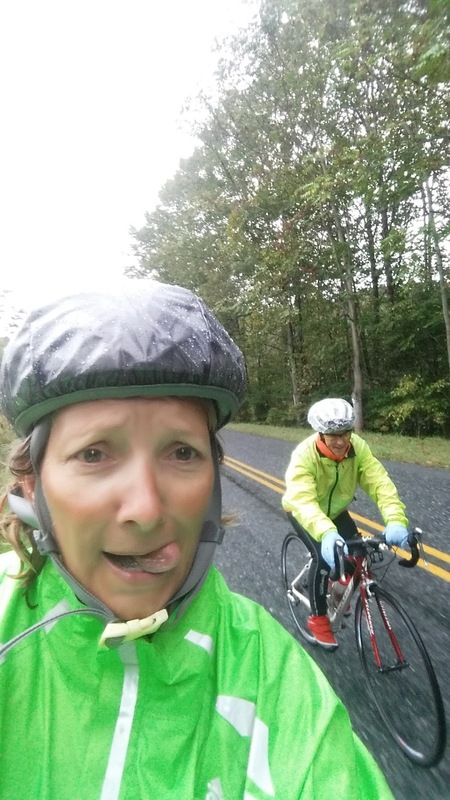 Riding 100's of miles in the rain. 2. Eating peanut butter for 30 straight days. 3. Bob growing a beard. 4. Sleeping in church parking lots. 8. Doing laundry in a camper shower. Today was wet, wet and more wet. We woke up to rain and are going to bed to rain. But we needed to ride anyways. Can't get behind! 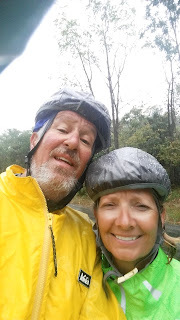 We could only muster 88 miles because of the rain. I have never been so wet in my life. 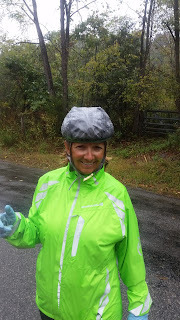 We wore rubber gloves over our cycle gloves, shoe covers, 3 shirts, shower cap on our helmet and 2 pairs of lycra bottoms. I didn't care that nothing matched. We sure got a lot of pitiful looks. 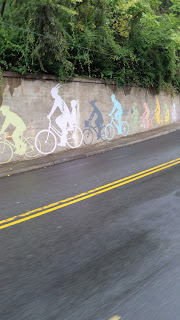 Most people wonder why we are riding on a rainy day. One gal, named Carol- not kidding, stopped us and started talking to us about her bike across America that she did in 1977. Fascinating lady and we invited her to dinner. She is observing horses and writing a book about their emotions. I love meeting locals and hearing about their experiences. Carol is going to make us breakfast tomorrow morning. She even offered to dry all of our wet clothes. Thought for the day- I was miserable cold and wet today and had a choice. The choice to keep riding or quit. I thought about the many people I have met who spent many nights on the streets- wet and cold. They didn't have the choices that I have. It becomes a survival mode when all you can think about is what you are going to eat, where you are going to sleep, how are you going to get warm. I couldn't stop thinking about chicken pot pie. I had become so focused on something pleasant, I could forget the misery of the rain. I suppose that is what alcohol or drugs do for some. It helps take away the present misery and pain. I so appreciated the Pope focusing on hunger and homelessness when he was visiting the US. It was all over the news as we drove by towns. I love his comment about prayer. He said pray for the hungry and then feed them! Day 35- Fall is in the air! Well, after 100 miles today, we made it to Radford, Virginia. I am in utter amazement of the Blue Ridge Mountains and the lush valleys of Virginia. The leaves are all turning on the trees and we saw beautiful streams almost all day. We had our last three big climbs today and then the rest was up and down hills. I find the up and downs harder to do than the big mountains. We had a headwind all day because a storm is moving in so it was slow going. Finally made it to Radford just as it was getting dark. I have a feeling we will have rain the last 4 days of this trip. As we are getting closer to the end of our ride, it is an amazing feeling that we have actually rode our bike across America. The realization is that anyone could do this...you just have to start. So many people thought we were crazy, including ourselves. But every day I rode a little bit to get ready. Every day I thought about what it would take. 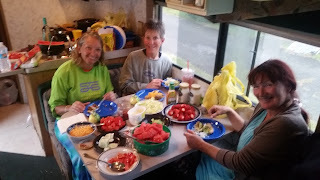 Then once we started the ride across America it changed to every day just pedal. Some days are slow, some days are painful and some days are brutal. But every day has been a learning experience. I have used this trip as research and development for Switchpoint. Learning from so many leaders I have met in towns and shelters along the way and listening to people who are in the trenches has been a valuable experience. Day 33 and 34- God Bless America! Out of all the days on the road, today was the prettiest. People who never go see America are missing out on the diversity and beauty. I asked people on the road all day yesterday and today if they had ever been to the Atlantic Ocean. Many said, "no, why would we leave our holler?" They have no idea what is out there. I saw so many people sitting on their porch, not working. I hollered up to three guys, "hey, how come you are aren't at work?" They hollered back, "cause we're waiting for the paint to dry." We stopped at a Walmart in Kentucky right before the border. A man was asking if there was any work at Walmart. The employee said there was over 3000 people out of work so stand in line. Coal is the major business and it is out of business in Kentucky. So many people are in poverty. 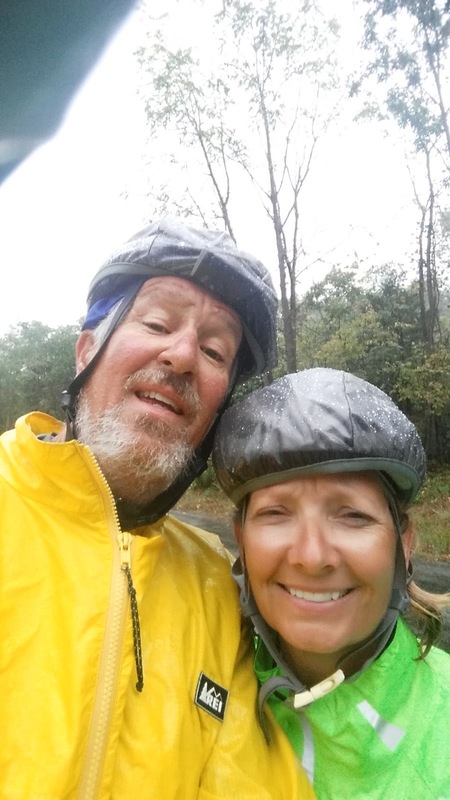 Yesterday we rode from Mckee to Elkhorn City, crossed into the Breaks Interstate Park. It was stunning since the leaves on the trees are all turning. Nights have gotten cooler and the mornings are cold to ride the first couple of hours, but we are so happy with fall! We had a special surprise guest show up today. A friend, Michael Cardon drove 6 hours to meet up with us in Damascus tonight. He lives in Ohio! What a nice break for us to visit. The funniest thing we saw today was three school buses chopped down full of hay bales. They passed us back and forth for 10 miles. I can't believe a school bus can hold that much weight- hope there weren't any kids on there too. Thought for the day- We are so blessed with the great country we live in. I have been amazed at the natural beauty of every state we have crossed. I have also been disappointed in the people who don't take care of it. Trash on the sides of the road, trash in the rivers. We all have to do our part to keep it clean. Virginia so far has had great roads. Kentucky could really use some work. Take some pride in where you live! Today was a great day! Why?? Because our bike is fixed and rode like a champ! 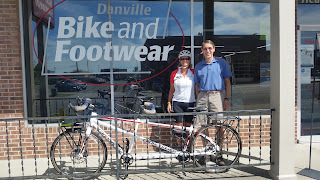 We stopped at the Danville Bike Shop and the owner, Earnst was so attentive and knowledgeable, He fixed all of our problems and got us safely back on the road. Come to find out he rode a tandem across the US with his 10 year old son. Small world. Danville has a lot of history about the Civil War, Abraham Lincoln, Constitution, etc. I love all of these small towns! The people are great and like to entertain you. One thing we learned today was Kentucky vernacular. A hill is really a mountain, a holler is a valley and a lick is an area where salt is found naturally. so many places back east have the name lick in them, so we had to ask what it meant! 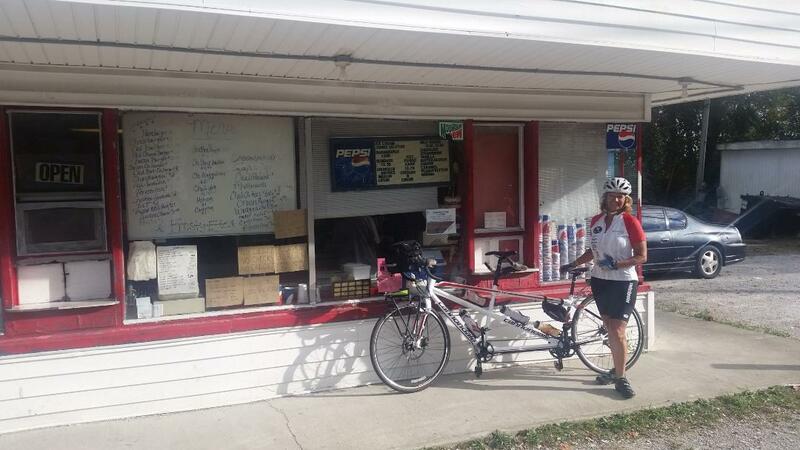 We visited with a family at an ice cream stop and asked how far to the next town. "Well, yer will go past all the licks and then down the holler and flat for 6 miles." Ok, thanks! This little store looked like it was out of business until we saw the family eating outside. It was the best ice cream sundaes we have found! I had to order through a screen that was held on by duck tape and he was smoking as he fixed it, but seriously great ice cream. One exciting moment today was a dog started chasing us. We had just bought some dog spray at the bike shop in Danville. So as Bob was yelling, I took aim and got him right in the face. It is like a pepper spray and only stuns him for a few minutes. But my aim was right on and he sat down and didn't bark or whine. Just put his face down. I don't think he will chase cyclists anymore. The scariest part is if the dog gets in front of your tire when you are going down a hill. Thought for the day- Mishaps can turn into great experiences. 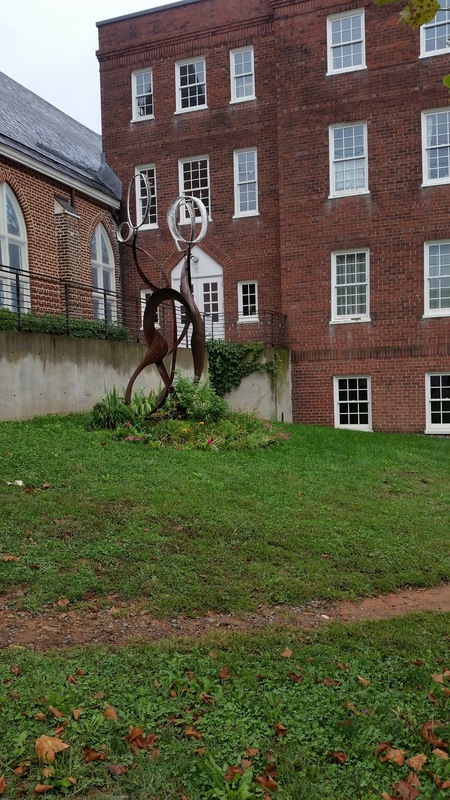 We weren't supposed to be in Danville, but because the bike needed a mechanic we ended up seeing a lovely town, met a great guy at the bike shop, and took a wonderful detour seeing all kinds of colleges, art, and landscape. I appreciate the unexpected mystery of the unplanned events of our trip. Thought for the day- Sometimes life just doesn't go as planned. If we have a Plan B, it is a lot easier to handle the bumps along the way. Our Plan B of finding less hills, having a Sag driver, stopping when lost- all added up to making it safely today. I could have lost it a couple of times but instead , we found a cute place to camp and enjoy the town. The stress of the day could have ruined our trip. I choose to be happy and see what tomorrow brings. We headed out of Itica with a forecast of rain. It only sprinkled a little in the late afternoon. 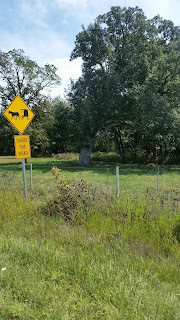 As we rounded a corner, a herd of Shetland ponies was loose on the road stopping traffic. The owner didn't look too happy. I asked him if he was the one that left the gate open and he yelled, "yes, what do you think? "- like his wife had already yelled at him. It was classic! We kept on climbing up the hills and then rolling down the other side. Gears kept slipping..The problem was we have worn out some teeth on our chain rings so needed to find a bike shop again. Very difficult to climb in the big ring. We sounded like we were dying trying to grind up the hills as we huffed and puffed in a high gear. We found a bike shop after 78 miles and Adam replaced all 3 chain rings. Much better!! Now we are ready for the Appalachians. We came upon a cute little town- Fordsville. They were having a county wide yard sale. Every house had a garage sale sign and traffic was backed up for miles. In town was a classic car show, a tractor show and all kinds of booths. Just as we pulled out of town, there was a sign in a yard for a checker tournament at 10 am! We rode a couple more miles and a cop car passes up with his lights on, then a hearse, then a whole line of cars with funeral flags waving. I made the remark that all we needed was a wedding to complete the day. Sure enough, when we hit Buffalo, there was a wedding going on in a yard. Ya gotta love it! I smiled all day. Thought of the day- We met a family with two young boys at a gas station. The boys had never seen a tandem bike and had a lot of questions. I gave them some bracelets and stickers and Janis gave them each $2 so they could go to the yard sales. One of the boys made a comment that stuck with me for the rest of the day. He was impressed that the three of us were riding our bikes across America. He said "someday I'm gonna do that too". I love that he was impressed at a young age to do something big. I really believe he will ride his bike across America. We all leave impressions on people. 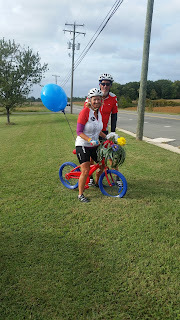 This young boy had never seen a tandem and couldn't believe this bike could go across America. His desire to be and do something out of the ordinary from what his friends and family know will spark him to be a leader. Illinois was a nice short state. We entered Illinois after another hard hill day in Missouri. I have never seen the raging Mississippi. It is a lot bigger than I thought. When we crossed the bridge, the town of Chester had a statue of Popeye. We were having a lot of bike difficulties and so we had to spend half of day 29 at a bike shop getting a new chain, a new cassette and a tune up. Doug, the owner of Phoenix Cycles was so awesome! He took great care of us and gave us his time even before his shop opened! Thank you Doug! I spent that time off at the Good Samaritan Shelter in Carbondale. I met with the Executive Director, Mike and he gave me a wonderful synopsis of what the economy was like. Coal has really taken a hit and the only big industry in that county is the college and the medical field. The state of Illinois is struggling financially to say the least and this shelter needs funds. The state hasn't released the grants yet for the year and this is a huge problem for Good Samaritan Shelter. I am so happy to be from Utah! Many of the clients at this shelter are displaced coal workers. We rode until we ran into our friend Janis again! She is the rider we met in Colorado. She is still riding strong and motivated me to quit my whining. 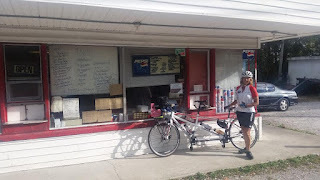 Day 30- Headed out of Elizabeth town and rode to the ferry on the Ohio river. This ferry is the shuttle between Illinois and Kentucky. Free ride! 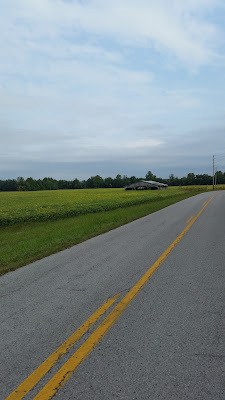 We rode past fields of tobacco, soy beans and lots of horses. Kentucky also has dogs, dogs that chase you. I spent the day acting like top gun "goose" to spot for dogs. No one got bit! We ended our day in the little town of Utica. Their volunteer fire department is awesome! They open their doors to cyclists for no charge. It is air conditioned, had washer/dryer, oven, and very accommodating. The fire chief came in and introduced himself. 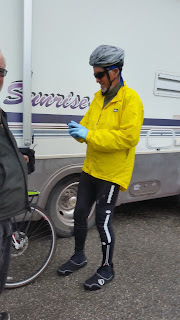 Keith said his dad started in 1976 started hosting cyclists at the local church and sometimes would have over 200 camped in the church backyard. So the tradition no continues at the fire department. Thought for the day- Energy is contagious! 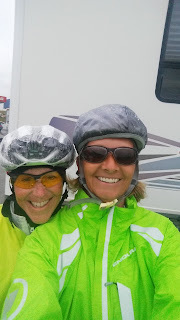 When we met up with Janis and realized we could ride some longer days and power through...we were so energized to get on the bike and speed up this finish. The same kind of energy happens in life. Stay around positive people and you are energized by their attitudes. Stay around negative people and you are drained. May we all be energetic and positive forces to those we come in contact with. Day 28- Are we done yet? Day 27 was so darn hard. I wanted to just go home! The hills never ended and they were steep! Like 18%. I thought about throwing up many times but Bob's back was in the way. Missouri is so pretty but the hills are monsters. We were in the Ozarks yesterday so there was no internet. Even though the roads are skinny, no shoulders, and mean dogs.... I still liked Missouri. My dad came up with a great! idea for our handle bars. Hand fatigue is setting in as we ride day after day. So he got some pipe insulation and then athletic bandages and fixed up our handle bars! It worked great! Then he fixed me up with a spray bottle to keep the dogs away. It has been an adventure for sure!! I have posted only the good stuff- but I got to tell ya all...This is hard. If it was easy everyone would be doing it. I am homesick, sore, tired, miss my work, miss my dogs. Whining... But as I go through these small towns of America, I am saddened by the poverty. We saw sign after sign of EBT accepted here and small food pantries in towns with less than 500 people, But we also saw church after church after church. There is so much patriotism and good neighbor living in these small towns. Last night we were in a town of less than 100 people. A man offered to give my dad a ride in the back of his truck to go check out a campsite. Genuine friendliness and goodwill abounds in the Ozark Hills. Today we crossed the mighty Mississippi and rode into Illinois. We met up with the statue of Popeye! Only 12 days left of this journey. We have ridden over 2600 miles and still have over 1000 to go. We made it-thought I was going to drop! We climbed over 6000 ft today in 104 miles. I can hardly stay awake to write this blog. That is how tired I am. We went up a hill, then we went down a hill, then we went up, etc. The scenery was the same as yesterday and we saw a lot of cows. One noteworthy observance- Missouri loves Dr. Pepper. We only saw Dr. Pepper cans on the side of the road, no beer cans. I want to take today to thank the sponsors who have helped us so far. It takes a strong community to make a change. I need to make a plea to all of you reading the blog. All donations from donations and sponsors goes to Switchpoint. None of it is being used to fund this trip. 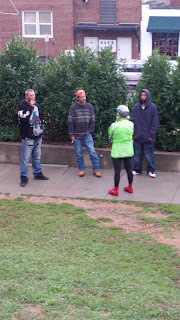 I wanted to bring about awareness of the homeless situation in America and gather and share data with different shelters. I wanted to raise funds to meet our need. If each person donates $20, it will add up to help Switchpoint meet the needs of those families who need assistance. Please forward our blog to all of your friends. It is easy to donate on the blog site under the donate tab. Thank you to Therapia Addiction Healing Center, AJ Construction, Cherry Creek Radio, Power Image, Brand Iconic, TechnaGlass, Bicycles Unlimited, On Target Pest Control, Adams Construction, SUHBA, Feed My Fit, Idaho Lawn, Jeff Hollowell and Anna and John Tadlock. Thank you to all of you who have given funds. Many of you have and I appreciate your generosity. Day 25-Missouri here we come! Day 23- Two great shelter visits! Day 18- don't give up!